This series is based around work undertaken at the Mathematical Sciences Research Institute in Berkeley, California. It will contain workshop proceedings, as well as lecture notes and monographs by visitors to the Centre. 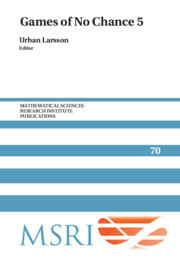 Volumes 1-27 of this series were published by Springer-Verlag; all others are published by Cambridge University Press.